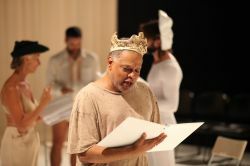 Miguel Gutierrez comes to the Museum of Contemporary Art, Chicago this weekend with one of his newest works,Â And lose the name of action.Â The evening-length piece features a striking cast of note-worthy performersÂ â€“Â MichelleÂ BoulÃ©, Hilary Clark, Luke George, Miguel Gutierrez, K.J. Holmes, and Ishmael Houston-Jones. 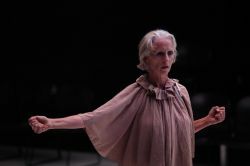 Inspired by JÃ¸rgen Lethâ€™s filmÂ The Perfect Human, the elusive logic of dance improvisation, philosophical quandaries about the brain, and the 19th century spiritualist movement, the piece draws connections between the analytical and the unexplainable, grappling with the limits of language and the ever-present spectre of death. It features music by Neal Medlyn, lighting design by Lenore Doxsee, and film/text by Boru O’Brien O’Connell. Jane Jerardi: Maybe first we should start first with you just talking a bit about the genesis of the project youâ€™ll be performing at the MCA, And lose the name of action? Miguel Gutierrez: Sure.Â I think Iâ€™m going to paint my nails as we do this [pulls out two shades of blue metallic nail polish] if thatâ€™s okay with you. JJ: Sure.Â Talk about mind and bodyâ€¦! MG: It feels like the right question to paint your nails toâ€¦Â Well, the piece really came out of a couple of things.Â In some ways it was an extension of Last Meadow [Gutierrezâ€™s previous piece], which is unusual for me, because usually when I finish a piece I want to change gears.Â But, by the time we got around to finishing Last Meadow, I realized I was only beginning to understand what I was doing.Â Towards the end of the project, I was introduced to this book The Meaning of the Body, by Mark Johnson, which calls for getting rid of the mind/body split, once and for all.Â Itâ€™s beautifully stated, but reading it as a dancer, there was a moment where I thought, â€œThis seems fairly obvious.â€Â For a person who has any kind of relationship to somatics, you of course recognize that the mind and body are connected; that perception is an embodied practice, and that all contexts are experienced through a sort of corporeal interaction. I thought to myself, This sounds like a contact improv class. And I thought, why is this new? I think it was that initial indignation that led to the piece. I felt like why isnâ€™t this something that is known? Â The second impulse for the work, was my dad.Â My dad had a series of neurological problems in 2008.Â He had a series of blood clots in his brain that were note properly diagnosed for several years. He had stroke-type things and then seizures, which then progressed during my research for And lose the name of action. JJ: You realize how marginalized some of these movement practices are. MG: Absolutely. I mean marginalized isnâ€™t even the word.Â Theyâ€™re invisible. I started to see how when people talk about brain, they are talking about mind. Lots of words are being used interchangeably.Â Thereâ€™s a lot of lack clarity in definition between disciplines.Â How is it that we have the same vocabulary but we arenâ€™t using words in the same way?Â I started to examine the value system around my teaching and practice.Â What is valuable about an improvisational performance practice?Â It is a kind of knowledge and a way of knowing, but quite different than other modes of knowing.Â And I though about Why am I so invested in this â€˜unknowing knowingâ€™? Â Why am I so mistrustful of alleged truths? That was all the stuff that led me into And lose the name of action. Then, I started thinking about ghosts and the paranormal. What about an immaterial body?Â What about a discipline of study that doesnâ€™t even presume that the body has to be tangible anymore? When we had our first residency we went on our first ghost hunt. JJ: Tell me about that. JJ: Big questions.Â Really big questions. JJ: So how did this all play out in your explorations in the studio? MG: A lot of talking, a lot of improvisational explorationâ€¦ In the piece, the bodies are the proof of themselves. MG: Yeah â€“ not even virtual or holograms â€“ butâ€¦ there are people that are doing that â€“ work thatâ€™s about post-human bodies â€“ but, I am still invested in the interpersonal dynamics of being in the room with people. Thatâ€™s what keeps me interested in my work. JJ: I think it goes back to the value thing.Â Whatâ€™s at the core of what you do? Working with Deborah Hay was pretty instrumental for me.Â Something she would say is, â€œThe movement is just a costume for perception.â€Â And, I feel thatâ€™s really true. Thatâ€™s my experience of dancing actuallyâ€¦Â So much of what intrigues me about dancing is about contending with myself in the moment.Â And all the fucked-up-ness of that question. JJ: â€œContending with things in the momentâ€ is the way that people talk often about improvisation. Youâ€™re working with a pretty incredible set of improvisers as collaborators performing in the work.Â I wondered if you wanted to talk a little bit about that?Â I mean itâ€™s a very diverse, powerhouse group of people. Miguel Gutierrez and the Powerful People, And lose the name of action, Walker Art Center, Minneapolis, Minnesota. Photo: Boru O’Brien O’Connell. MG: Yes.Â I wanted to have a group â€“ well first, that werenâ€™t all young 20-year olds.Â I wanted a diverse age range for this piece. Â I hadnâ€™t worked with a group of people who were older than me before.Â And, I wanted a group of improvisers who could own themselves in a very clear way. I wanted to work with people who seemed restless or curious.Â And, I feel like thatâ€™s pretty true of this group! MG: Hilary Clark, Luke George, KJ Holmes, and Ishmael Houston-Jones.Â At first, I was a little like â€“ oh my god, who am I to tell these people what to do? It really did feel that way.Â Which was great, because I wanted to be challenged directorially. JJ: It seemed to make a lot of sense to me because youâ€™re dealing with a kind of big existential topic â€“ life and death, philosophical truths such as â€˜person-hoodâ€™ and â€˜being.â€™ It requires a certain maturity. MG: Yes.Â It feels important that the audience is looking at people who have contended with things. I also think that I was going through something about casting in general. This thing that often happens in the dance field is people donâ€™t take into consideration the representational value of the bodies that are there. JJ: Which is kind of saying, maybe the visual does matter.Â The way that we read bodies matters. MG: Absolutely.Â Bodies come marked. But, it feels like often the problem with the visual rendering thing is that people ignore it in the most important aspects in some ways.Â Because they think â€œIâ€™m dealing with abstraction.â€ Or, something neutral. I know that when I first went into dance as an adult, I was excited about how it contrasted to theater, because I didnâ€™t feel like I could get type-cast in the same way. I didnâ€™t have to audition to fulfill just one thing. It wasnâ€™t like â€“ â€œOh, Iâ€™m that Latino kid.â€ So, itâ€™s funny to have come full circle and now become hyper-conscious about who is on the stage.Â But also, I think now more than ever â€“ the way artists work â€“ youâ€™d be hard-pressed to find a choreographer whose not working explicitly collaboratively with their dancers. Although, I sort of suspect thatâ€™s always been true.Â Thereâ€™s a real thought around how you have people involved in your process. JJ: I wonder if we could talk about some of the other collaborators involved and, some of the sources because in a way you could think of sources as collaborators. MG: Somewhere towards the beginning of the process I read Freedom, by Jonathan Franzen. I realized that writers give themselves permission to do so much.Â You really can go there.Â You can interrelate different things.Â A novel â€“ or that kind of novel letâ€™s say â€“ doesnâ€™t aspire to be minimalist. Certainly thereâ€™s editing. But it doesnâ€™t see reduction as the only compositional value to explore.Â As someone who has struggled with living in an aesthetic climate where minimalism is privileged above all else, Iâ€™m excited to encounter work that deals with interrelating or association. I started to realize that what we were making â€“ in a sense â€“ was a novel. For example, each dancer wears multiple costumes in the piece â€“ Iâ€™d never done that before.Â Or, even having people leave [the stage space]. JJ: By having people leave and re-enter there could suddenly be chapters. MG: Yes, I really feel like the piece does unfold in that way. JJ: Even though a lot of the piece comes from the idea of embodiment, youâ€™re also using text in the piece. Could you could talk a little bit about how the text figures into the work? What drew you to using text? MG: The bulk of the text it written by Boru Oâ€™Brien Oâ€™Connell (who also collaborated to create video projections).Â Some of the text is an appropriation of George Berkeleyâ€™s writings. Text is often used as the locator of meaning. And, if it exists in a performance â€“ thatâ€™s when weâ€™re like â€“ thereâ€™s the meaning!Â That definitely happens in this piece. But, it also functions as a texture. It functionsâ€¦almost like a kind of perfumeâ€¦. JJ: Thatâ€™s a nice image. MG: â€¦A kind of experience thatâ€™s not even exclusively about it being attached to understanding. Jane Jerardi is an artist working in the media of choreography, performance, and video installation.Â Currently based in Chicago, her work has been presented at such venues as Transformer and The Warehouse (Washington DC), Defibrillator (Chicago IL); Danspace Project at St. Markâ€™s Church and the LUMEN Festival for Video and Performance (New York), among others.Â She is one third of the cohort that runs Adult Contemporary, an alternative art space in Logan Square.Â She teaches at Columbia College, Chicago, where she is also on staff at the Dance Center.